For Tuesday morning we’ll see the tail end of that NW energy, but the winds will whip up in the afternoon and start to kick up some decent sized wind swell… the only problem is that the conditions will deteriorate quickly. The surf will roll in from 300-310 degrees and have 13-14 second intervals. We will also see some fresh South swell move into the picture from a fairly steep 185-190 degrees. The conditions look less than ideal with onshore winds in the 2-6 MPH zone until 10:00AM and 10-20 MPH breezes out of the West in the afternoon. The air temp tops out at 71 degrees. For Wednesday morning we’ll see continued 9-11 second interval NW wind swell from 300-310 degrees get into the OH to WOH zone for the top West facing beaches. South swell remains in the equation from that same steep 185-190 degree angle with 15 second intervals. The conditions are leaning toward mediocre at best with onshore breezes in the 9-16 MPH zone all day long. The air temp tops out 70 degrees. For Thursday morning we’ll see continued NW energy roll in from that same angle of 300-310 degrees and have 10-12 second intervals. That swell should generate surf in the head high to OH zone. South swell will continue to pulse from 185-190 degrees with 13-14 second intervals. The conditions look a little iffy again with variable breezes out of the West, in the 2-6 MPH until noon and 10-12 MPH out of the West in the afternoon. The air temp tops out at 69 degrees. 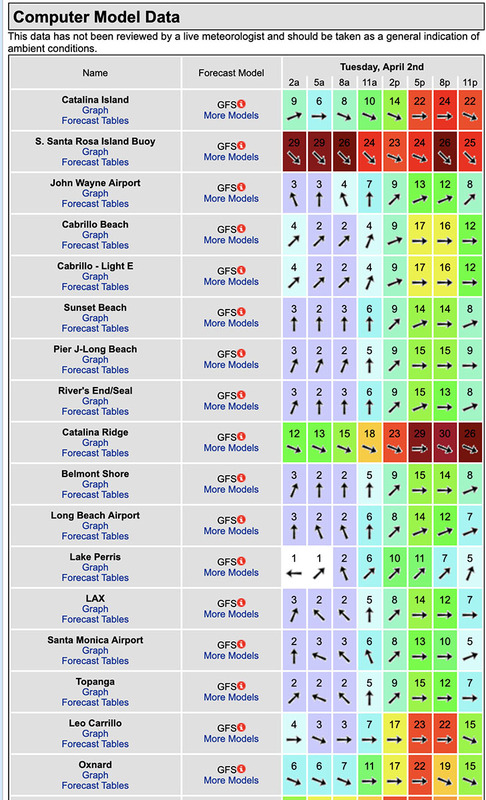 For Friday morning we’ll see another beefy NW wind swell, (300-305 degrees with 10-12 second intervals). The best West facing breaks will see OH to WOH sets and there could be some widow maker waves mixing in. The conditions look iffy at best, (see wind model below). The air temp jumps up to 69 degrees. For Saturday morning the NW ground swell will dip down into head high to OH zone with 10-11 second intervals from 300-305 degrees. The conditions are fair with variable breezes in the 1-5 MPH zone until noon and then 9-11 MPH winds out of the West in the afternoon. The air temp tops out at 69 degrees. For Sunday morning the NW ground swell will dip down into chest high to shoulder high zone with 14-15 second intervals from 300-305 degrees. The conditions are fair with variable breezes in the 1-4 MPH zone until noon and then 8-10 MPH winds out of the West in the afternoon. The air temp tops out 67 degrees. Water temps are as follows, (day of 4CAST update) and are as follows: Malibu 58 Santa Monica 60 South Bay 60, Huntington 58, Newport 62. The next 4CAST will be posted on Thursday!